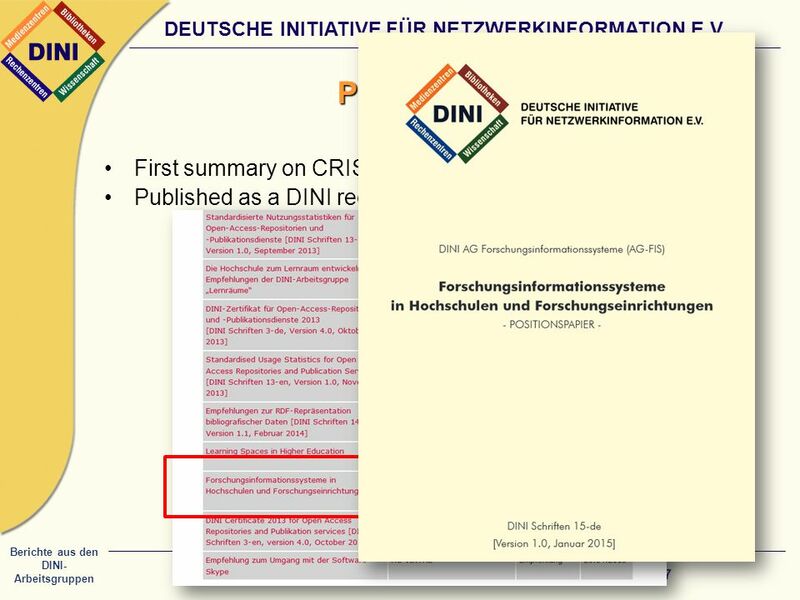 13 Berichte aus den DINI- Arbeitsgruppen DEUTSCHE INITIATIVE FÜR NETZWERKINFORMATION E.V. 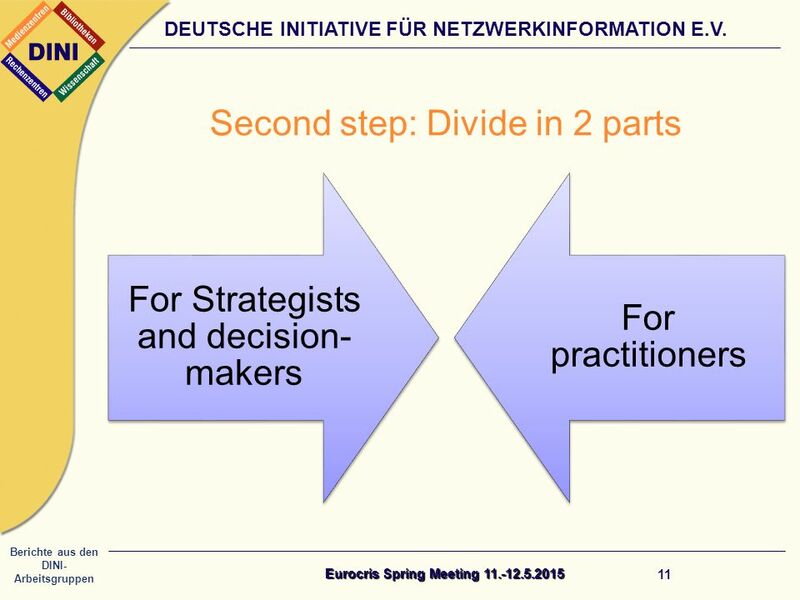 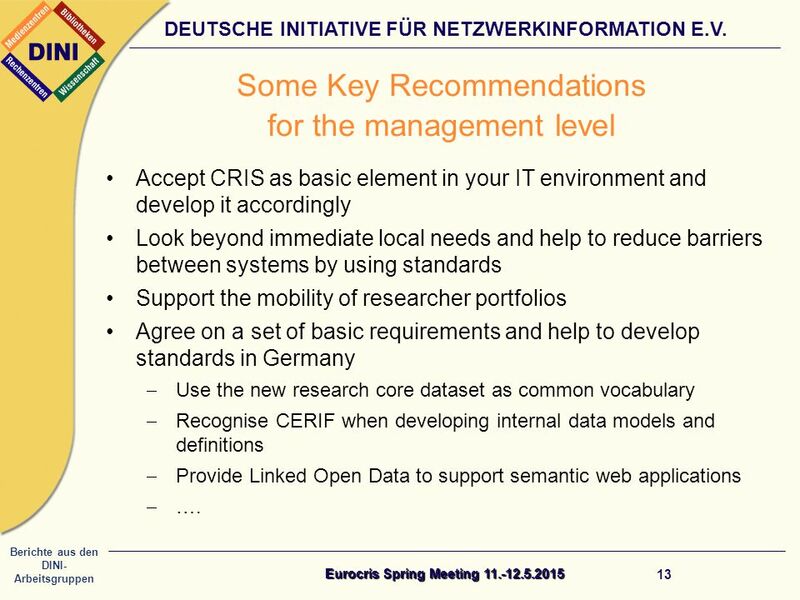 Some Key Recommendations for the management level Eurocris Spring Meeting 11.-12.5.2015 13 Accept CRIS as basic element in your IT environment and develop it accordingly Look beyond immediate local needs and help to reduce barriers between systems by using standards Support the mobility of researcher portfolios Agree on a set of basic requirements and help to develop standards in Germany  Use the new research core dataset as common vocabulary  Recognise CERIF when developing internal data models and definitions  Provide Linked Open Data to support semantic web applications  …. 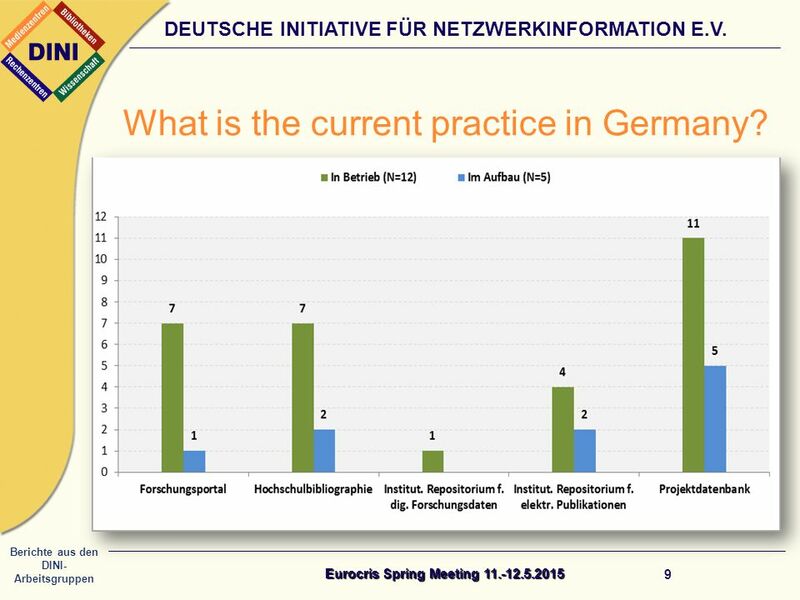 17 Berichte aus den DINI- Arbeitsgruppen DEUTSCHE INITIATIVE FÜR NETZWERKINFORMATION E.V. 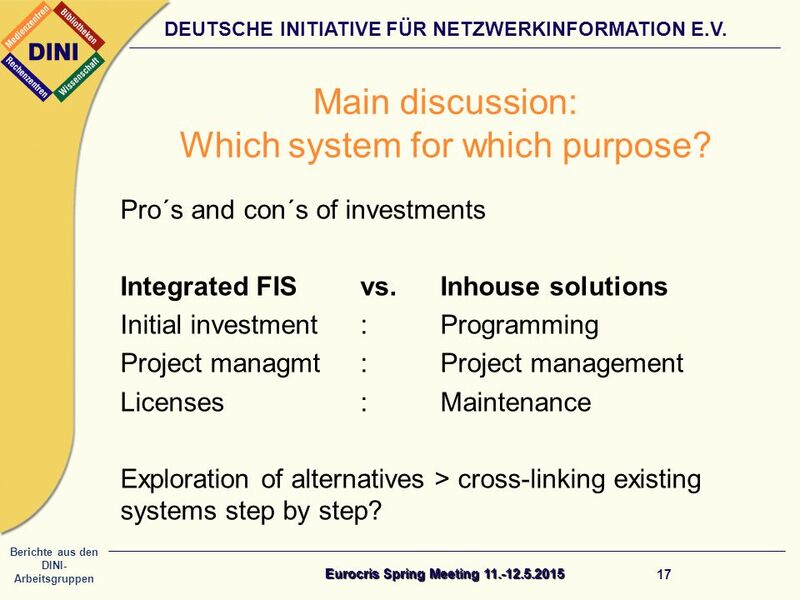 Main discussion: Which system for which purpose? 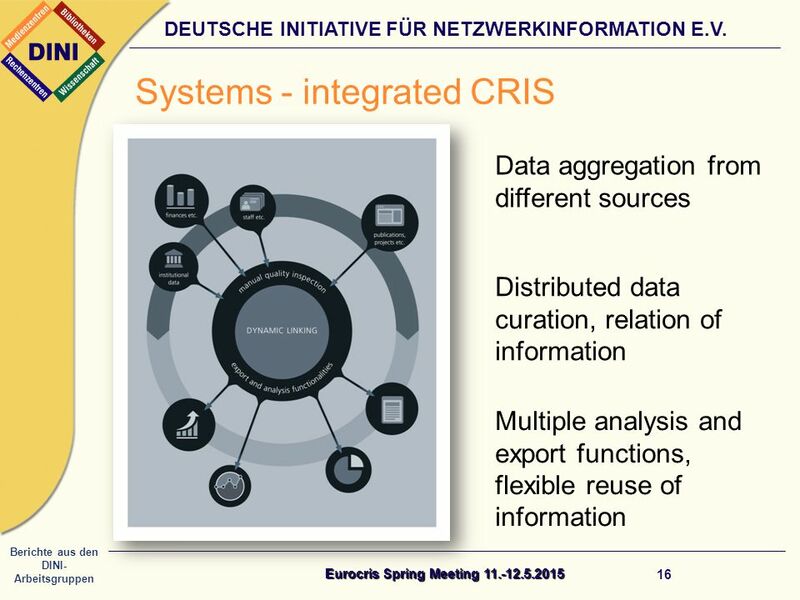 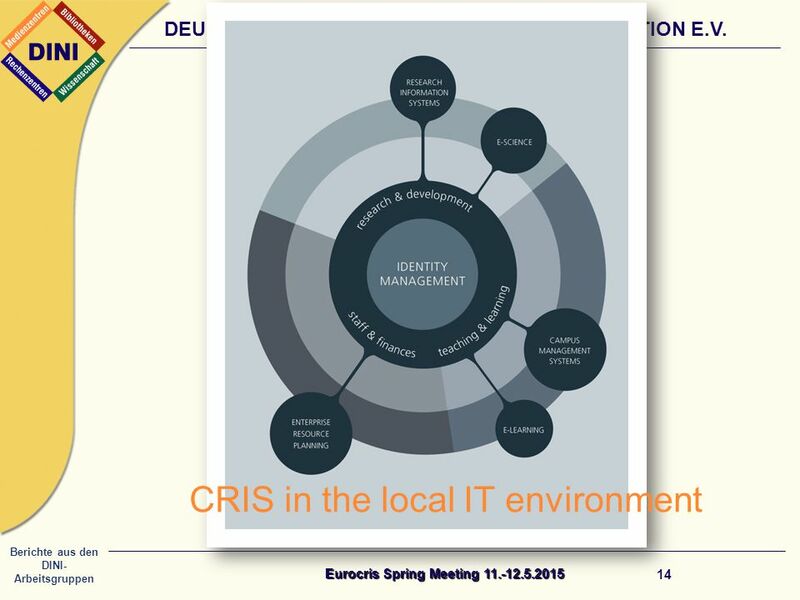 Eurocris Spring Meeting 11.-12.5.2015 17 Pro´s and con´s of investments Integrated FISvs.Inhouse solutions Initial investment:Programming Project managmt:Project management Licenses:Maintenance Exploration of alternatives > cross-linking existing systems step by step? 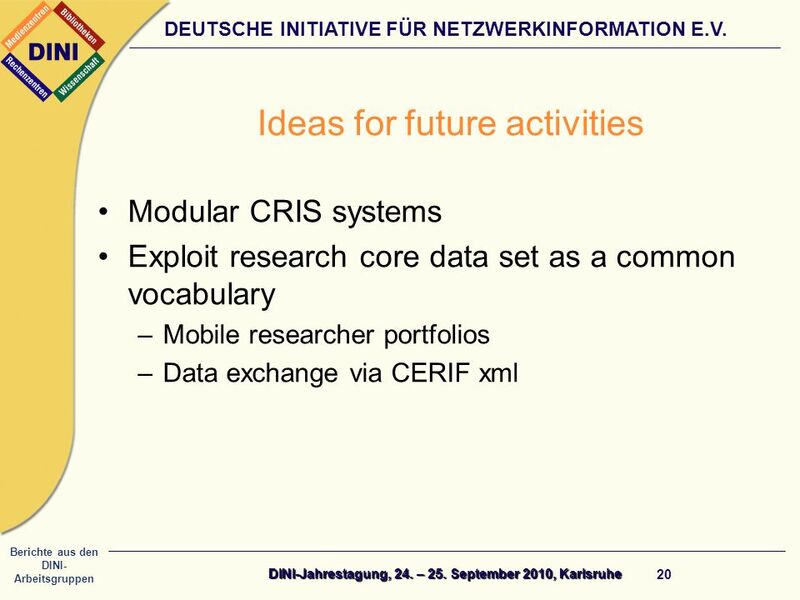 Herunterladen ppt "DEUTSCHE INITIATIVE FÜR NETZWERKINFORMATION E.V. 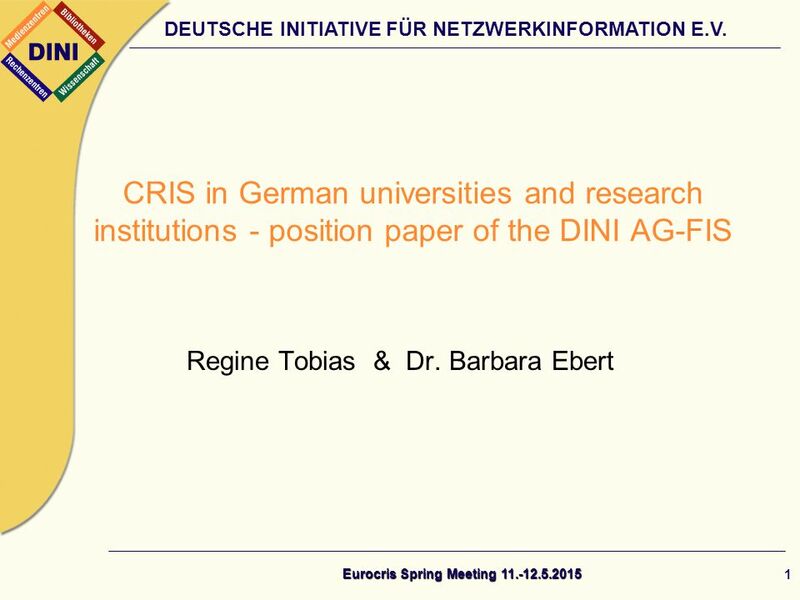 Regine Tobias & Dr. Barbara Ebert CRIS in German universities and research institutions - position paper." 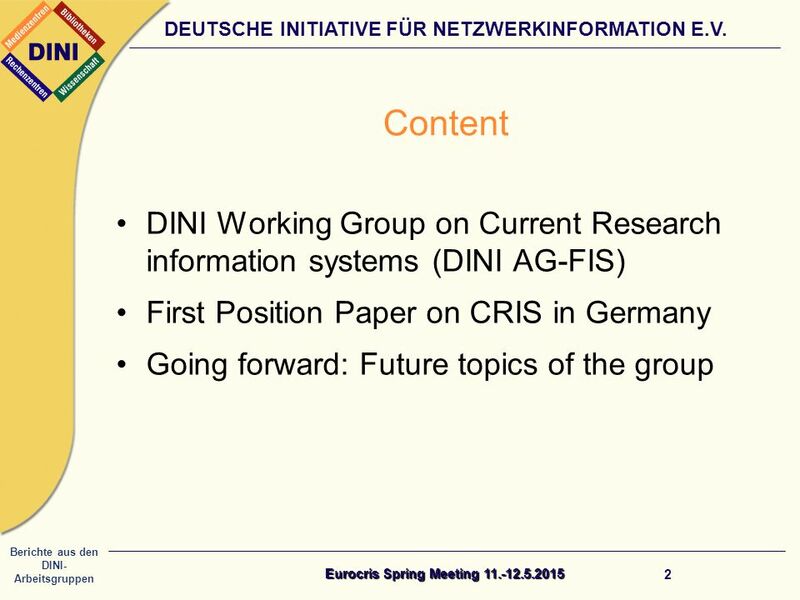 Berichte aus den DINI- Arbeitsgruppen DEUTSCHE INITIATIVE FÜR NETZWERKINFORMATION E.V. 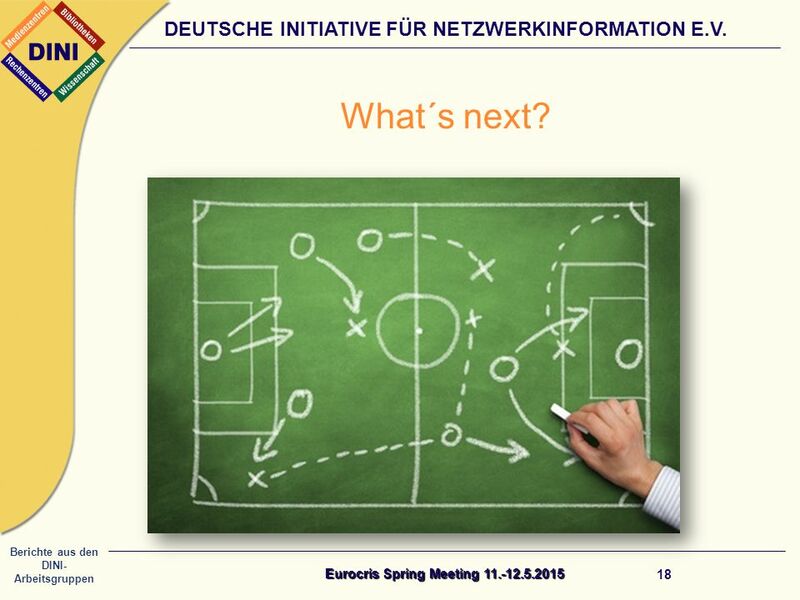 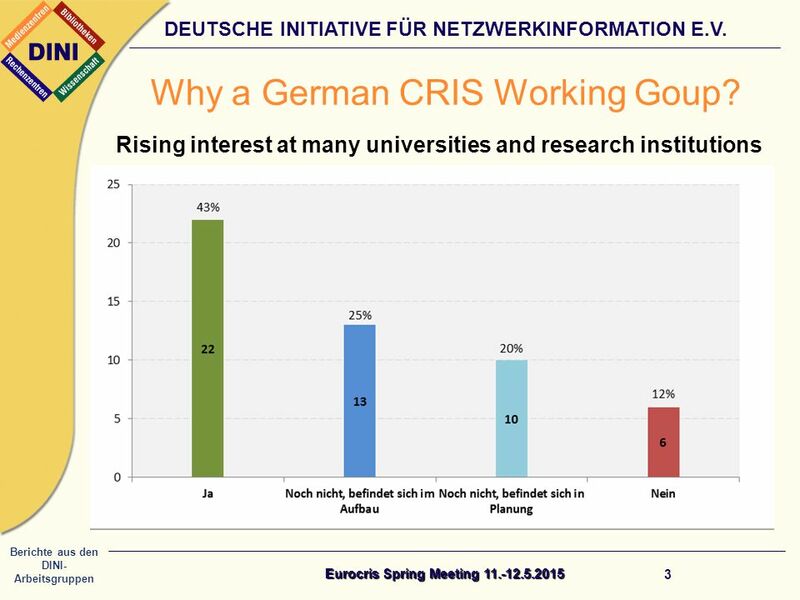 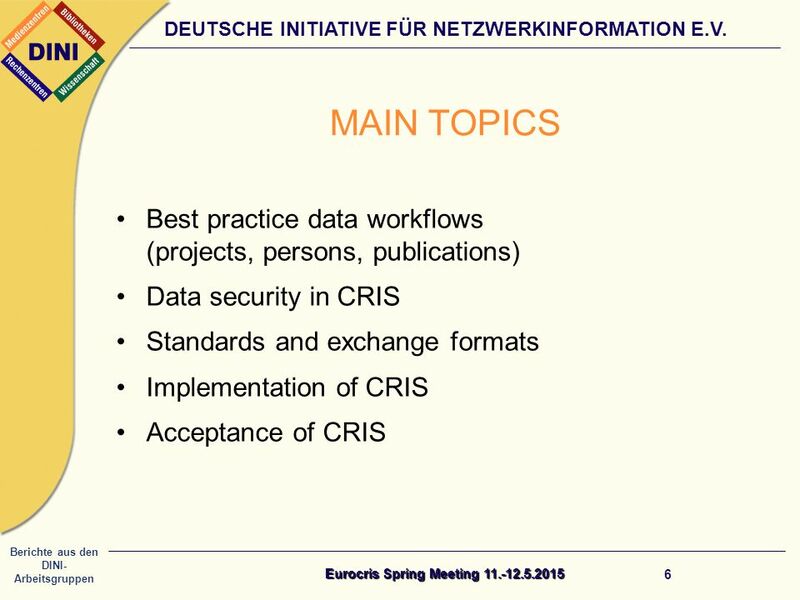 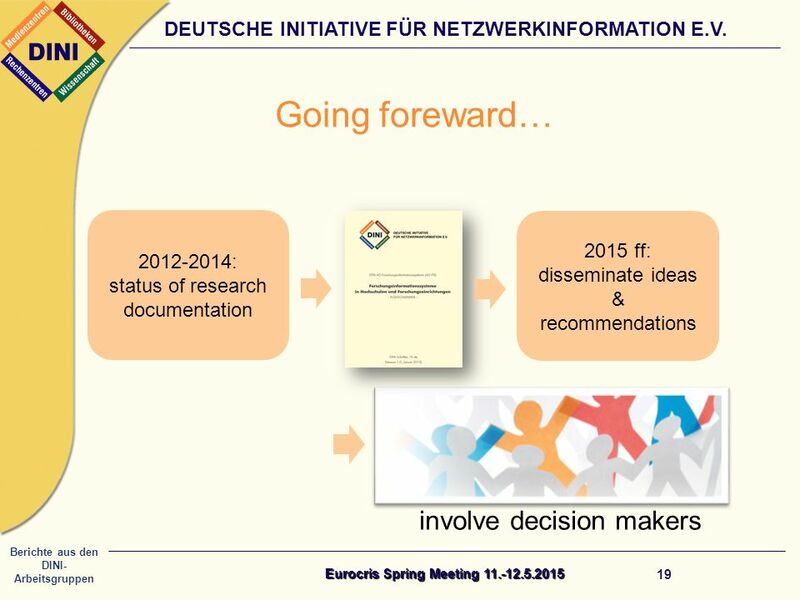 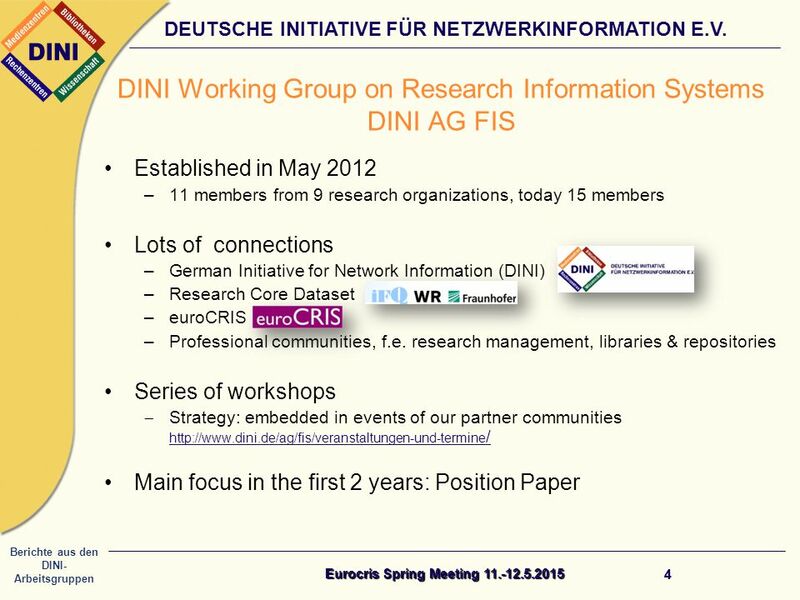 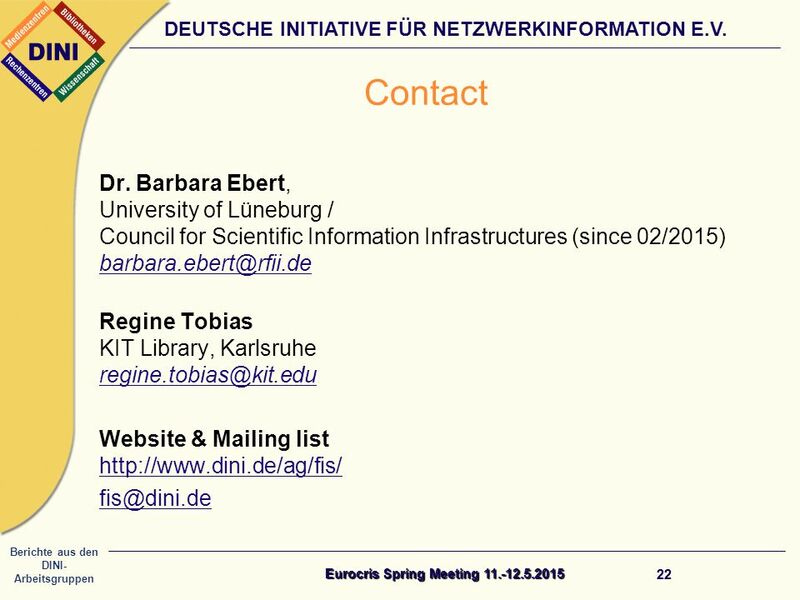 1 CRIS community in Germany: Establishing the DINI working group.